Most of all, for the best looking body possible, exercise with intensity as long as you want or can. Furthermore, use the latest United States Government fitness guidance. And these federal guidelines give you fitness guidance on how much time and intensity is best for your situation. Finally, check out the new recommendations on stretching before exercising . Most of all, the fitness guidance below apply to adults under 65 years of age with no limiting health conditions, and are generally fit. First of all, at least 150 minutes of moderate intensity aerobic activity, such as brisk walking. Otherwise, 75 minutes of vigorous intensity activity, such as jogging and swimming. On the other hand, an equivalent mix of moderate and vigorous intensity aerobic activity each week. In addition, moderate or high intensity muscle strengthening activities on 2 or more days a week. Furthermore, the muscle strengthening activities work all major muscle groups. Also, the muscle groups include legs, hips, back, abdomen, chest, shoulders, and arms. First of all, at least 300 minutes of moderate intensity aerobic activity, such as brisk walking. Otherwise, 150 minutes of vigorous intensity activity, such as jogging and swimming. Most of all, the fitness guidance below apply to adults 65 years of age and older, are generally fit. In addition, they have no limiting health conditions. First of all, at least 150 minutes of moderate intensity aerobic activity, such as brisk walking or gardening. Otherwise 75 minutes of vigorous intensity activity, such as jogging and swimming. On the other hand, an equivalent mix of moderate and vigorous intensity aerobic activity each week. In addition, moderate or high intensity muscle strengthening activities on 2 or more days a week. Furthermore, the muscle strengthening activities include lifting weights or using resistance bands. And, the muscle strengthening activities work all major muscle groups. Also, the muscle groups include legs, hips, back, abdomen, chest, shoulders, and arms. First of all, when older adults cannot do 150 minutes of moderate-intensity aerobic activity a week because of chronic conditions, they should be as physically active as their abilities and conditions allow. Most noteworthy, use a 10 point scale where 0 is sitting and 10 is working as hard as you can. First of all, moderate intensity is 5 or 6 if it makes you breathe harder and your heart beat faster. Also, you’ll notice that you’ll be able to talk but not sing. And, vigorous intensity is 7 or 8 if your heart rate increases quite a bit. In addition, you’ll be breathing hard enough that you won’t be able to say more than a few words without stopping to catch your breath. Finally, if you want to do mix of vigorous and moderate intensity exercise, follow the following fitness guidance. Most noteworthy, 1 minute of vigorous intensity activity is about the same as 2 minutes of moderate intensity activity. Especially, relevant, the latest fitness guidance no longer recommend stretching before starting your exercise. Rather, the recommendation is that you start your exercise routine with a warm-up. And, an easy walk or a sport specific activity such as easy serves or ground strokes in tennis will do. Furthermore, do the warm-up for five to 10 minutes. As a result, the warm-up gets the blood flowing through your muscles and warms them up. And then you can stretch your muscles. Otherwise, you can stretch them after your exercise routine is over. Yet, another method to figure out how intense you are exercising, is to use the heart rate table below. First of all, the table shows target heart rates for different ages in beats per minute (bpm). Also, the maximum heart rate is about 220 minus your age. 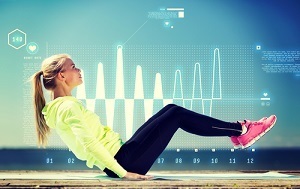 Furthermore, the High Intensity Interval Training (HIIT) column id sourced from the American College of Sports Medicine. Yet, HIIT should be approached with caution – it is meant for those who are in excellent physical condition. Furthermore, even though the column has numbers for those over 60 and especially over 70, HIIT may be inappropriate for you. Most noteworthy, you can monitor your heart rate by taking your own pulse or using any of the wearable devices that are widely available. Especially relevant, is that if you are just starting out, aim for the lower number in the “Moderate Intensity” column (50 percent). Most noteworthy, exercising, following fitness guidance, will get you the maximum health benefits. Yet, that doesn’t mean you can’t exceed the fitness guidance. Most of all, those who are into sports, training for athletic competitions, or are really into working out hard, may exceed the guidelines. In conclusion, always listen to your body, use caution, and protect your body.